Thanks to the explosion of craft brewing, the number of beers and beer styles out there can be tough to wrap your head around. Keeping track of what you’ve tried and what you haven’t can be even more taxing. Sure, you can use an app like Untappd, but that too has a fatal flaw: You can’t proudly display an app on your wall to show off your drinking prowess to your house guests. Enter Pop Chart Lab’s 99 Bottles of Craft Beer on the Wall Scratch-Off Chart. 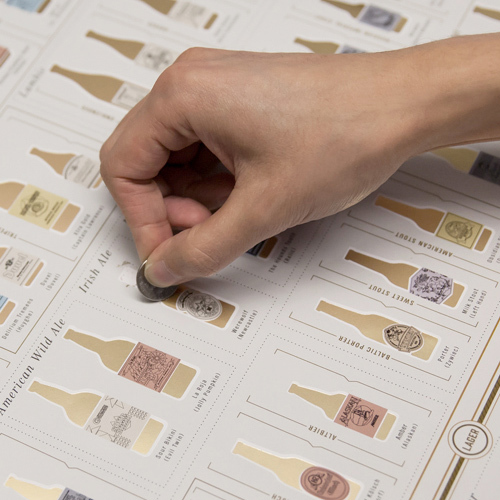 More than just a catchy name (and it is a solid name), the visually pleasing poster gives you the chance to keep track of different beers you’ve tasted by scratching off the gold foil from an image of the bottle. So, in the end, this $35 poster can probably best be described as a beer scavenger hunt. Which in turn means if you’re looking for a way to kick off your craft beer drinking career, this list may be a great place to start. Or if you want to reach instant beer snob status, buy the poster and scratch off everything but St. Pauli Girl.